How will southern gardeners react when they find out that we can grow Crape Myrtles here in Indiana? Regardless, ha! We can grow Crape Myrtles in Indiana! I saw some the other day at Lowes. Now, normally, just because a plant shows up at Lowes, I don’t assume it is good to plant it in my garden. But, my own sister has two Crape Myrtles growing quite well in her Indianapolis garden, so I wasn't all that surprised to see them at Lowes. That’s one of her Crape Myrtles pictured above. In case you think hers are just a fluke, or were a bit skeptical like I was, I also got an email recently from a reader in Michigan with pictures of Crape Myrtles growing “clear up there”! Here are the ones I saw for sale at Lowes. And here’s a picture of one growing near Coldwater, Michigan sent by reader, Stephen A. That area of Michigan is also zone 5, like Indiana. Those I saw at Lowes were primarily Lagerstroemia indica, which surprised me because according to this Clemson University website, Lagerstroemia faurei is the more cold hardy species. Funny thing, too, on the Clemson website they are spelling the common name as Crapemyrtle, all one word, but in the web address they spelled it “crepe”. I know it isn’t “crepe”, but is it one word or two? The tag on the ones at Lowes mentioned them being “root hardy” which usually means the branches die back over the winter, and new branches come up from the roots in the spring. This is what Caryopteris and Buddleia do when we grow them here. I asked my sister and she said that does cut hers back each year like a butterfly bush. Based on that, I wouldn’t expect any Crape Myrtles around here to become big trees or huge shrubs. But for gardeners who would be satisified to have a few Crape Myrtle blooms in their zone 5 garden, regardless of what size the plant grows to in one season, it might be worth the effort. So what say you, southern gardeners, are you happy for us, that we can have Crape Myrtles in Indiana? Are you pulling my leg? This is too good to be true! Maybe they're hardy only to Zone 5b, not to my Zone 5a garden. Ah, I knew there was a catch, they're dieback shrubs. That's Ok, as long as they bloom. To bad there isn't a Lowe's near me. Several new varieties were unveiled at GWA last year, so I would give them a try. Theoretically hardy to zones 5/6. Let me know! We always want the difficult-to-grow! In Davis they grow everywhere..and I am not that fond of them. Kind of like bottlebrush. Proving the attraction of playing hard to get I guess. That would be me saying, “No fair, you’ve already got lilacs!” And what's even more unfair is that your sister's crepe myrtle is one of the lavender-colored varieties instead of the usual hot pink. If you want to grow "crape myrtles", Carol - go right ahead. But I grow Crepe Myrtles - that other spelling is just too tacky. Oh, and it's actually crapemyrtle. See the National Arboretum's article on it. I don't have the link, but you can google it. I know that there are several cold tolerant cultivars, but I don't think they will be reliable beyond zone 6. Most likely they will behave more like a cut-back shrub as several have indicated. They grow house sized here and are probably one of my favorite trees. I sell many to people who visit here in the summer and stuff them into trunks to take home to places far colder. This summer I sold one to a couple taking it to S. Dakota, a personal record for the furthest away. I told them to keep it in a pot a be prepared to pull it into the garage for the winter. I don't know what varieties I have, but I did purchase them in Williamsburg, Virginia. This year the Japenese beetles didn't attact them very much. I might have to move one of them because it is too shaded and didn't bloom this year. Can I do that without killing it? We can grow Crepe Myrtles but they don't grow up and have that beautiful exfoliating bark like they do in the South. I love their blooms no matter what. Ok Carol, I'll bite: No fair - you've already got Lilacs!!! No, I am thrilled that you get to have these wonderful trees. They provide us with beautiful bark, stunning and long-lasting blooms and even leaves that change color for us in the fall when few others do down here in Texas. And thanks to Dee for telling us that they are one word ... never seen them treated that way, but I can learn new tricks! So, did you buy one? What are you waiting for?! This is one southern gal who is glad to hear this good news. I really miss the crapemyrtles. I did see those at Lowes but thought it couldn't possibly be true. I just might have to give those a try! Thanks! Hi, Carol--first a hearty CONGRATULATIONS! Blotanist of the Year, indeed. Easy to see and well deserved! Now, crepe myrtle. I did a long post about six weeks ago and there was much interest about whether they might grow in colder climates, so I'm certain there will be folks who are glad you've added to that conversation and affirmed it can be done in your zone. Thank you! I'm happy that you can grow them, Carol. Only it's a shame you won't have the twisted and muscular trunks of a mature tree. I've grown up seeing this plant name spelled crepe myrtle, so I don't think I'll be changing my tune anytime soon. Tradition, you know. Carol, our Lowe's had them on CLEARANCE! $12 and I didn't buy one! They were pretty good-sized, too - three to four feet. I just know I'm going to be sorry I didn't at least try one! 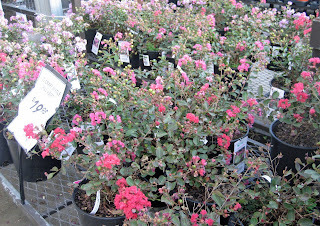 You've got to be kidding says I to the shrub buyer at our nursery - a crapemyrtle in Chicago ? Are you in zone denial ? He just smiled and said I was waiting to see the look on your face ! Then he pointed to the Magnolia Grandiflora 'Edith Bogue' and smirked. Wish I had a bigger garden. Like Pam, I grew up calling them crepe myrtles (NW Florida, you know), so I won't be changing any time soon, either. But bravo if you can grow them - I'd have a hard time existing without them. The National Arboretum has introduced a number of hybrids that are root hardy to zone 6, but you know you can often "push" a zone if the conditions are right. The ones with Indian names are the hardier ones, but not all are root hardy to zone 6. 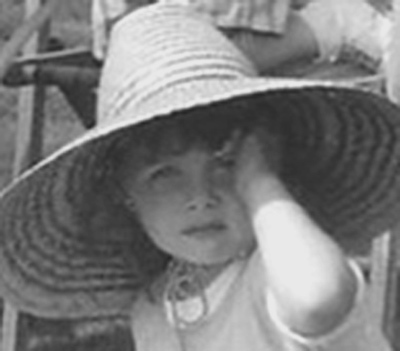 The National Arboretum website has a lot of good information - Good Luck! I think everyone should be able to enjoy crepe myrtles, that most southern of blooming trees. I've been so envious of Southern gardeners who show these beautiful trees. I just assumed they wouldn't grow here--hmmm, I may have to run over to our Lowe's and see if they have any. You Southern gardeners wishing for lilacs don't have my sympathy (In fact you can have mine mildew and all). You have camellias, ceonothus and saphoras that I wish I could grow. There is another set of cold hardier crepe myrtles called the azzle-dazzle series that stay as small shrubs for containers if necessary. That shoiuld have been razzle dazzle. I'm glad to hear it! I'm hoping to find one for my small garden (zone 6) next year, so it's good to hear that you can keep it low growning by cutting it back every year. Good for you! We are overrun with crepe myrtles in my neck of the woods and though my gardening friends here would poo poo me, I like them. I have two. I have a large Natchez (white) in the front and a volunteer from the neighbors that is lavender. You know the good thing about them? They attract bees. Lots of 'em. That makes me happy. I don't prune my front one at all, unless it touches the roof. What would happen if you didn't prune yours? My mature one has the most wonderful cinnamon trunk! 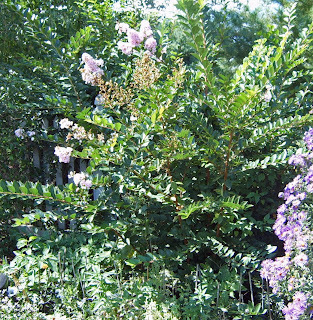 You can grow lilacs AND peonies, and you want crape myrtles as well? OK, I'll agree on the condition that you only grow them as shrubs! I'd recommend you keep them away from swimming pools, though: they're messy when they shed. Wow, it seems like most are viewing this as good news for us gardeners in zone 5. Just remember, pick varieties known to be root hardy and don't expect it to become a tree. We are in it for the blooms! They are crepe myrtles here, like the crepes you eat and crepe paper -- because they're frilly, I imagine. There is a little hat over the first E. I want a crepe myrtle or two; I think they are fantastic plants, with the autumn colour (not all deciduous plants colour up here), the beautiful bark and the small size. I live in West Lafayette and have had 2 Crape Mrytles for 3 years. This will be the fourth year. They do die back all thge way to the ground but reamerge every spring a little bigger than the year before. 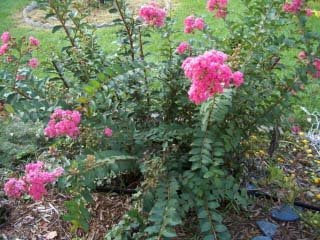 I have been growing crapemyrtles in southeast Pennsylvania for 15 years. There are many varieties that grow well here and even develop into small to medium trees. Pink Velour is one of my favorites. Hopi, Tonto, Sarahs Favorite, and Acoma also do well. I live in a far Chicago suburb and the 6 Crape Myrtles in various locations well away from the house have survived and grown significantly wider and stronger for the past 5 years. 4 of the 6 have flowers in 2011. The 2 exceptions are the "Country Red" that are in a mostly shade east understory garden. The 2 "Dynamite" have flowered 4 of their 5 years post winter. 2 Catawba looked dead after the winter of 2010 - 2011 but both are 3+ feet and have flowers. Yes they die back to the ground but they can reach 5 feet and flower by August when most everything else looks tired and dry. The foliage is also attractive and unusual for the area. Just cover with 12" of leaves in the fall and they will likely return the following year with no issues. for additional insurance, cover with snow if temps are to fall below 0. I have a Crape Myrtle growing in Indianapolis on Geist Reservoir -Zone 5. Not the nicest winter weather. It is not a cut back. I do trim the suckers that grow on the sides, but it has 3 strong branches and is a story and a half high! How can I get one of your crepe myrtle trees.